This picture just says it all. It’s good to own an iPhone. I want one. Wait, $499 each? 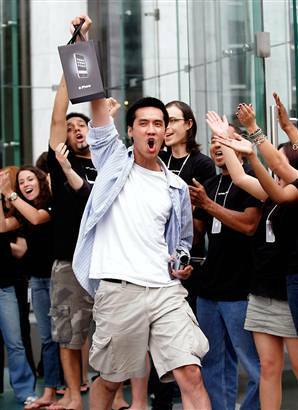 Above, cheering customers in line as one of the first waiters finally gets his iPhone. Was it worth it? Ever wonder what the internet looks like from a bird’s eye view? I’m not talking about web sites but rather how networks are connected all over the earth. Below is a picture I found at the Pop Sci Blog that shows a 3D map containing nodes, the larger the node the closer to the center of the map it is. 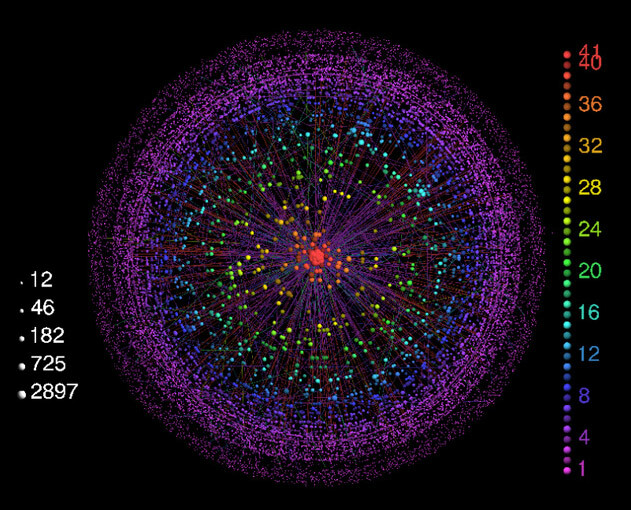 Nodes, in this case, from smallest on the outer edges to largest in the center, are actually organizations such as your local internet service provider, AT&T, Google or anything that controls some kind of network that data travels through on the internet. The map sprawls out like a tree from center to it’s outer edges, connected vertically. The article mentions how inefficient it is to have data travel through these large bottle necks at the center of the map, because if you start at one edge of the map you must travel through the middle to get to the other side. There is no going around the edges of the map: sort of like when you send an email using Google’s Gmail service, it must travel through the center to get to it’s destination address. I wonder what a future map of the internet will look like, say in 10, 30 or 50 years? Wouldn’t it be nice not to have to travel through the center just to get where you are going? Very Cool Strategy Game with Lasers! I’ve updated my laser gun tutorial that I started about a year ago. Finally got some time today to wrap that up. This tutorial assumes you have gone through my light saber tutorial because the steps and concepts involved are built on the methods from creating star wars styles sabers. Let me know if you need more details. FYI, today I’ve mailed copies of the Track 2007 Highlight Video to all who signed up last week. You should receive the DVD early next week (mon-wed). If you’d like a DVD copy but haven’t signed up yet, please email me at mike@mlsstudios.com with your full name and address. Thanks! OK, I just posted the entire highlight film for the Cal State San Marcos Track & Field 2007 season (by popular demand). There are 5 short videos I put together for this one and a few new special effects, go check it out here and enjoy! Today I created a website for a good friend of mine, Richie Gray. He recently graudated from Cal State San Marcos and is now attending the Southern California College of Optometry. He is also getting married on June 23rd, congratulations Richie! Richie has also appeared in several of my videos since the spring of 2004 and has been a tremendous help to my work over the years. Thanks man, and good luck! You are currently browsing the MLS Studios Blog weblog archives for June, 2007.